Nick Genes discusses some important but generally well-known critiques of FOAM on Ken Milne's SGEM. It's a great discussion and well worth your time. They also discuss the recent back & forth in EP Monthly between Nick and Joe Lex. Also well worth a look. "It's nice, it's a beautiful adjunct... I think you can still be a great doctor without FOAM." Perhaps the most important point is that trainees in particular need a foundation, and FOAM doesn't do a good job of providing one. There are some great and growing resources for foundational EM, including EM Basic, BoringEM, and many parts of Life in the Fast Lane. But sadly, there is not a good, rigorous curriculum for the bread & butter. Ken also rebuts Nick with one of my favorite points regarding the critiques of FOAM: there is not a single weakness of FOAM that is not also a weakness of traditional sources. This includes questions of quality and arguments to authority, which may be easy traps in FOAM, but are in now way peculiar to online sources. Lastly, let me make a plea. I don't care if we call it "FOAM" or "FOAMed" -- although keep in mind that the only reason we use the hashtag #FOAMed is because the foam party people were already using #FOAM. If we want people to take us seriously -- and they should -- we should take ourselves seriously and present ourselves seriously. That doesn't mean we shouldn't have fun at conferences or stop referencing the Simpsons and Star Wars -- even major peer-reviewed journals have fun (see here & here). One of my major goals as Assistant Social Media Editor for Annals of Emergency Medicine is to figure out ways we can separate the wheat from the chaff in FOAM, so those who deserve it get appropriate credit from their chairs, deans, and P&T committees. So let's be serious. 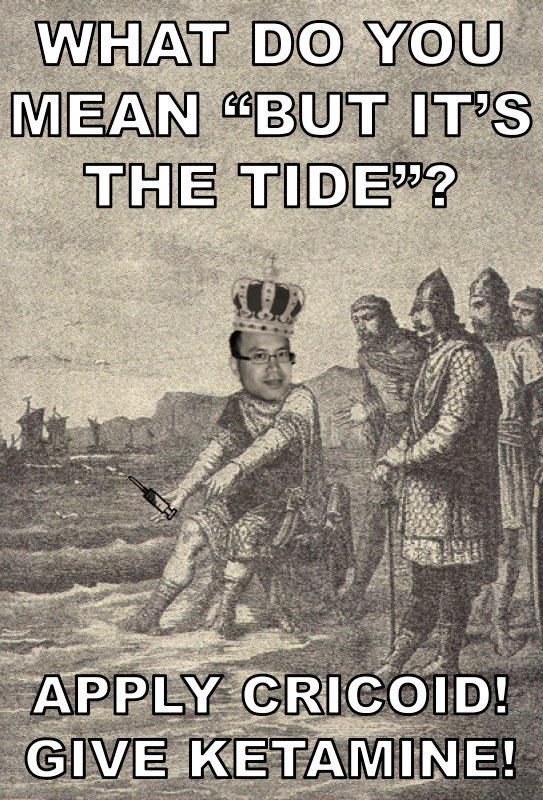 Really I just wanted a permalink for this meme of Minh. Note that the point of the story was that King Canute was demonstrating his inability to control the tides.